Special thanks to Troy-Bilt for sponsoring this post! 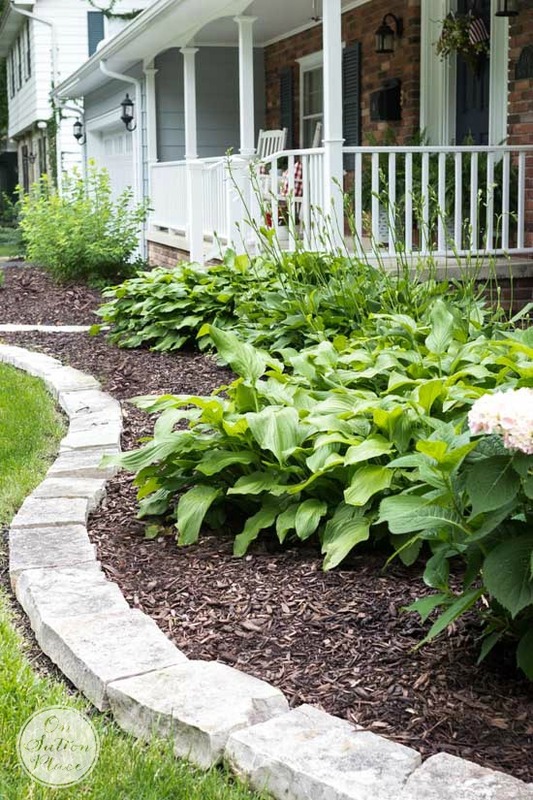 Today we are going to explore some garden edging ideas that help keep unwanted plants and grasses out of the beds, but also give your gardens definition, character, pizzaz and boost curb appeal. We will also go over my favorite, recommended tools to help maintain a clean and manicured edge. Let’s take a peek at some unique types of garden edging ideas first! Most of the beach homes we’ve stayed at use local found shells to line the borders of garden beds. 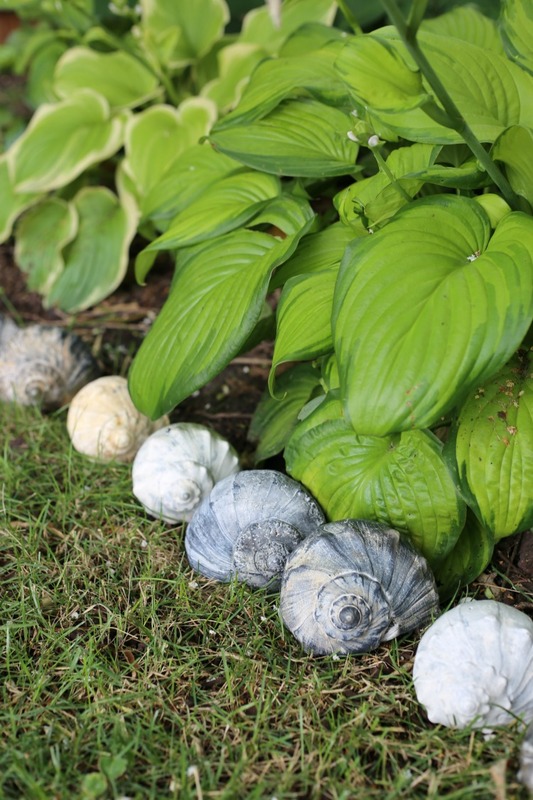 Of course, being a coastal design blogger, I couldn’t resist using this summer’s beach combing bounty collection to create a beautiful whelk shell garden edge in our backyard. 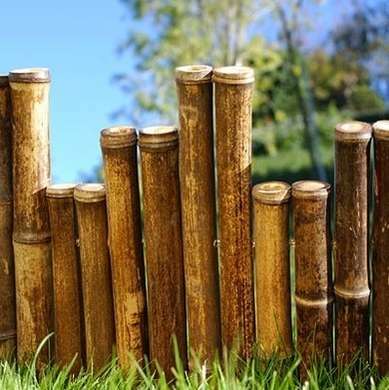 Bamboo edging is an affordable and because bamboo grows so quickly, it is a very eco-sustainable option. This would be perfect for any zen themed garden. Calling all wine lovers! 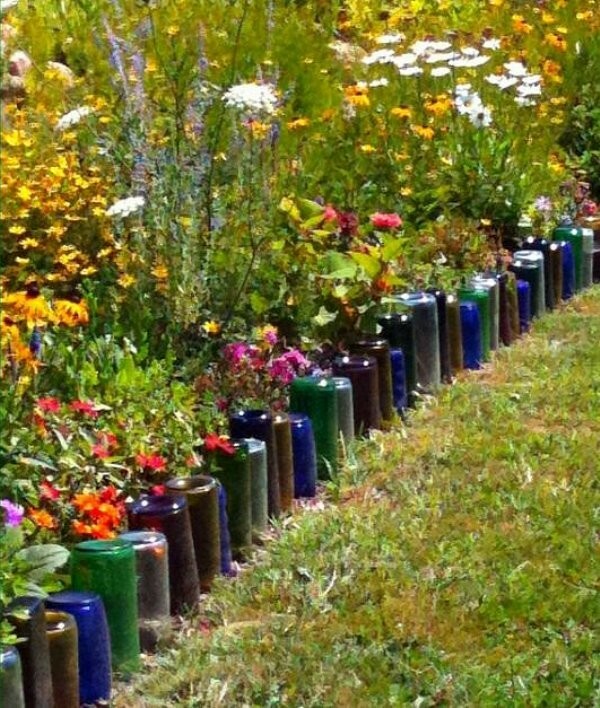 Recycle old and empty wine bottles to create a whimsical wine bottle garden edge. Your garden will be the topic of conversation at you next outdoor party. Note: Take extra caution when trimming grass near the bottles. Consider filling the bottles with sand before burying for better durability. These metal posts form a very sturdy and will develop a rusty patina over time. 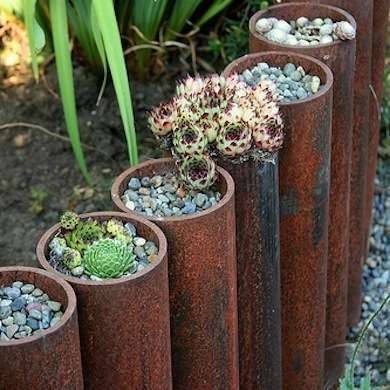 Fill with pebbles or soil to create an unexpected succulent garden. 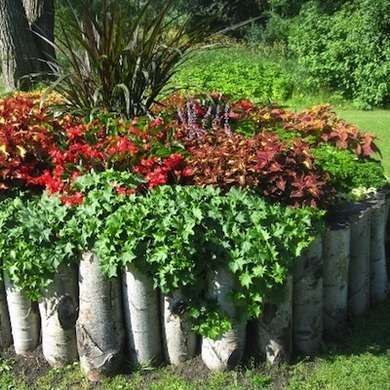 For a relaxed and woodsy look, a birch log border could be a an easy DIY project, especially if fallen branches/trees are readily available around your home. Cut birch logs in equal lengths and bury ends 6-8″+ deep in the soil (plant deeper if back filling with soil). 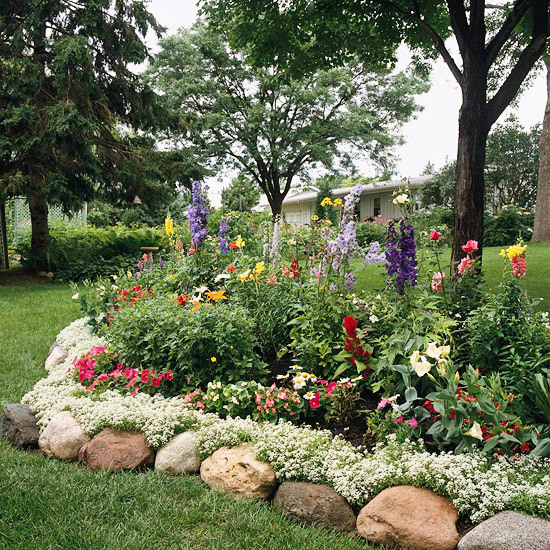 Now let’s explore some more traditional, yet just as lovely, garden edging ideas. 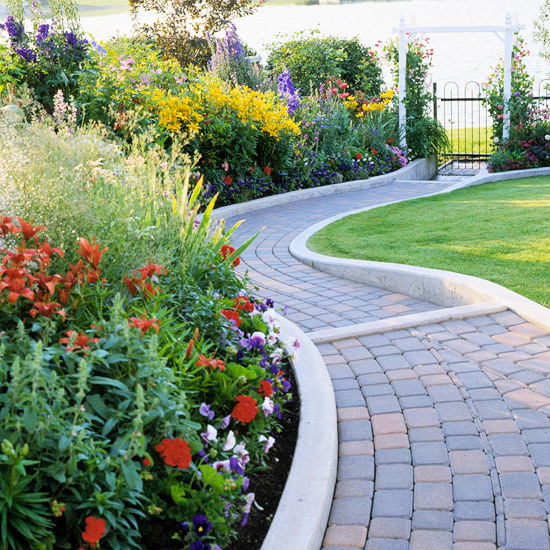 Brick garden edging is probably one of the most popular edging options. It is also a prime choice for front yard garden beds. Brick can be quite affordable and configured in a multitude of design layouts. A traditional side-by-side design is easy for a homeowner to do. Place bricks very close to each other in a bed of sand and then fill the spaces in between the bricks with more sand. 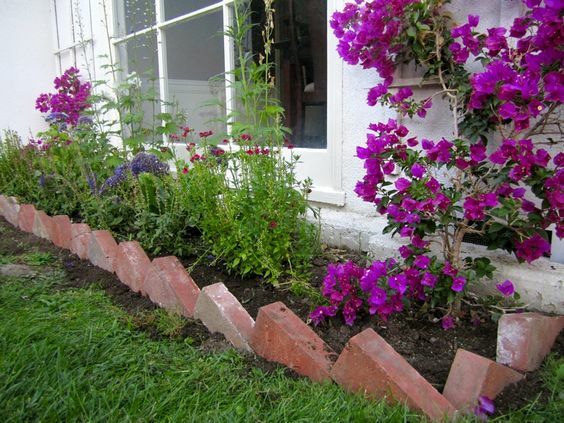 Diagonal brick edging is created by digging a trench and laying bricks diagonally upon each other and then back filling. Stone is another favorite garden edging preference. Stone can come in multitude of colors to coordinate with the exterior of your home. The variety of shapes can range from small cobblestones, to bricks, and huge slabs. It is also plentiful in DIY big box stores. 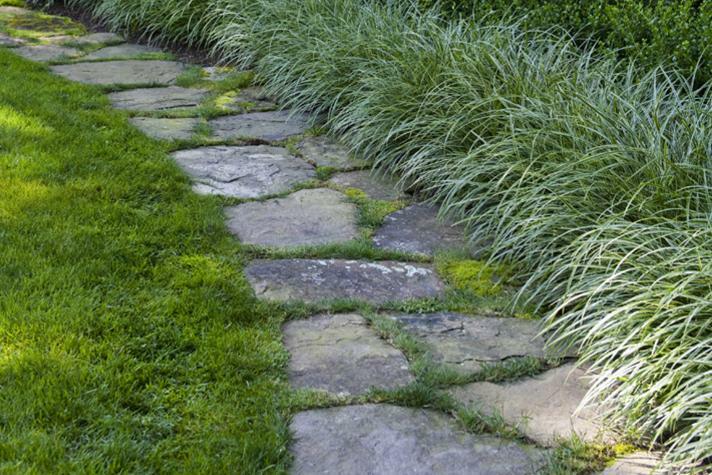 Cutting grass along bold, thick cut flagstone borders is a breeze for a homeowner. Flagstone borders are natural looking and quite easy to install. 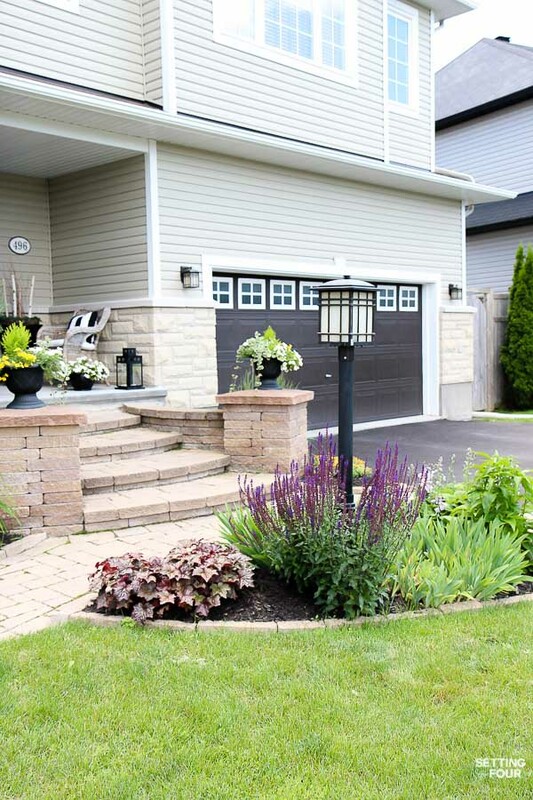 Stacked stone garden edging is perfect for a relaxed, cottage styled garden. It too is a simple DIY yard project. 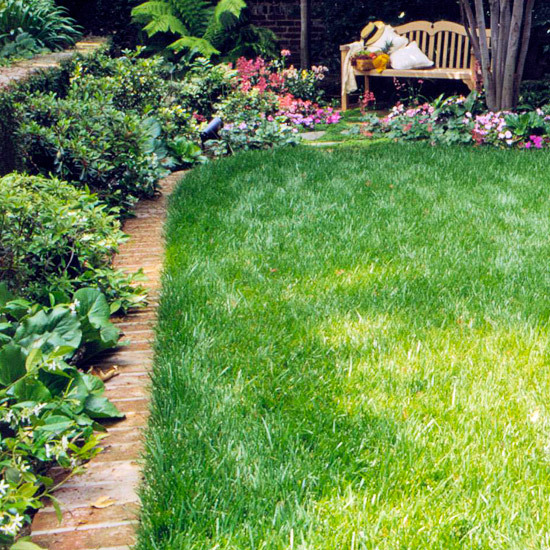 Consider laying large field stone garden edging at ground level for easy lawn mowing. No weed wacking required. The flat field stones make a nice path along the garden bed too. Cast Concrete Edging can be a great option for those who want a permanent garden border. This project is usually best left to the professionals, but if you are a skilled DIY-er then there are several online tutorials that might be helpful. 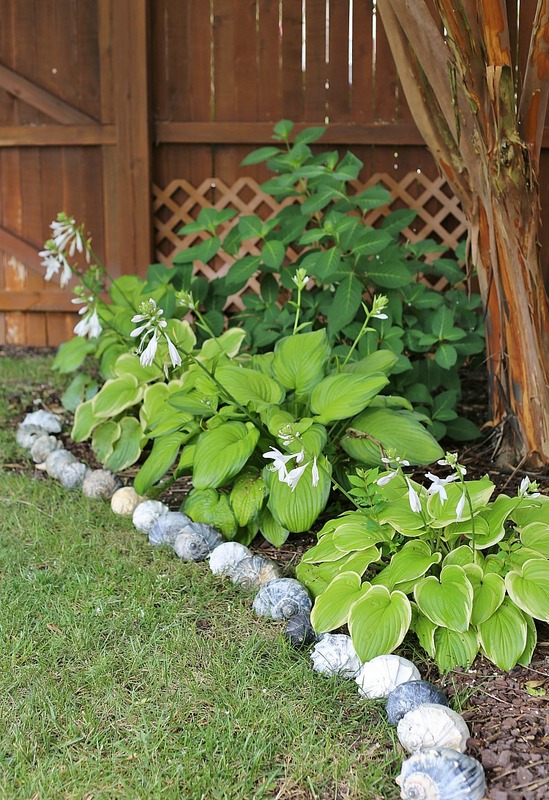 River rocks and bolders are a casual and natural way to line a garden bed. 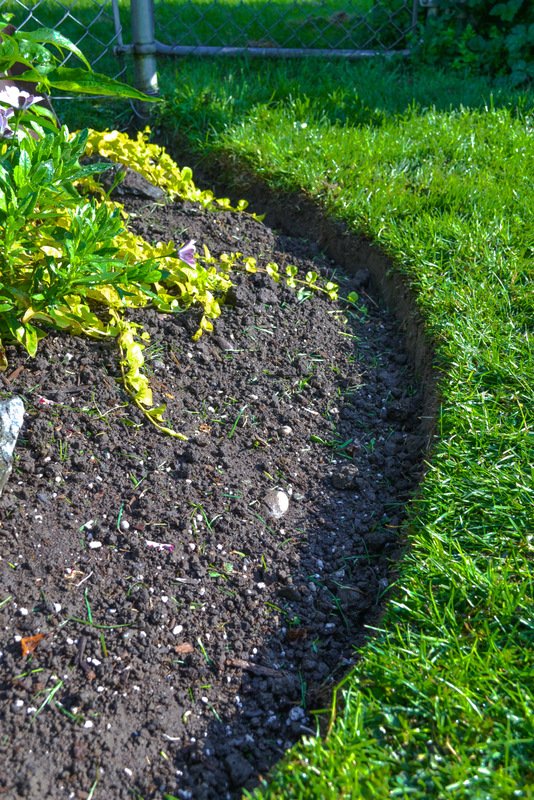 Natural garden edging is always a popular option. It only takes a few garden tools and a bit of sweat equity. There are a few techniques that will help create a nice clean edge. Funky Junk Interiors has a great tutorial on how she edges her garden beds . 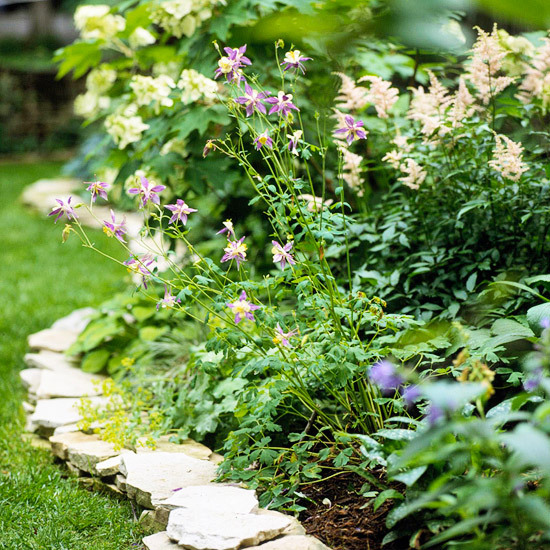 I have a few recommendations for tools to help you maintain a beautiful garden edge. 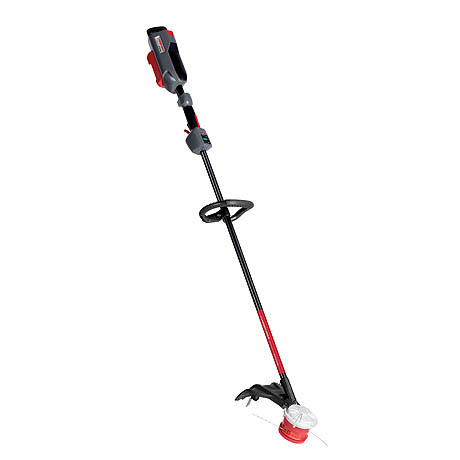 I have tried a multitude of string trimmers and so far one of my favorites is the Troy-Bilt Cordless String Trimmer powered by CORE. The trimmer is lightweight (which is so nice for me!) and has as much power as a gas trimmer, which is pretty impressive for a cordless trimmer. With the slight push of a the trigger I have maximum power when I need it. 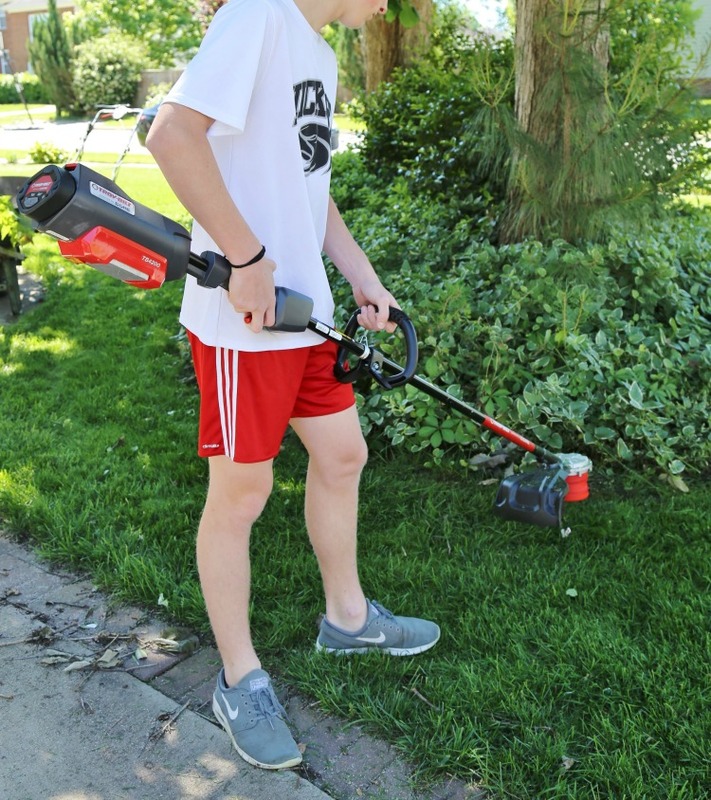 The trimmer can be used to trim grass and make sharp cut edges easily. 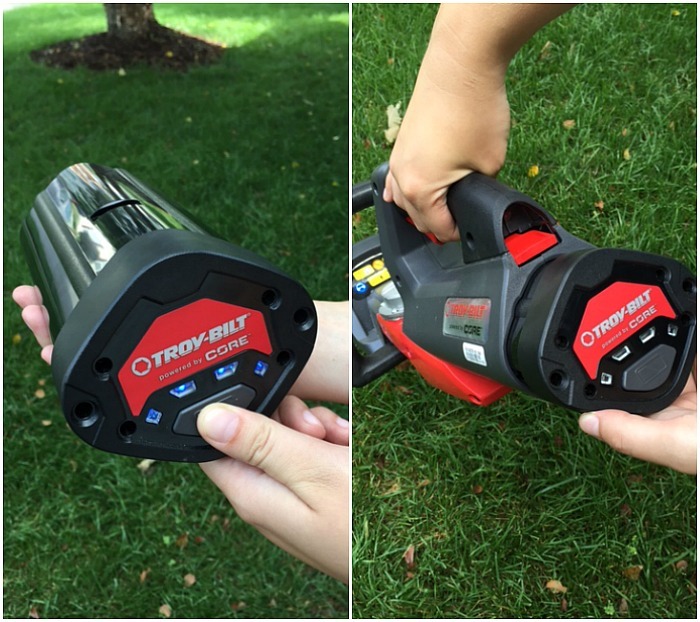 The CORE battery displays you how much power you are using and the best feature is that the battery lasts long, charges quickly, and can be used with the entire Troy-bilt CORE equipment line. 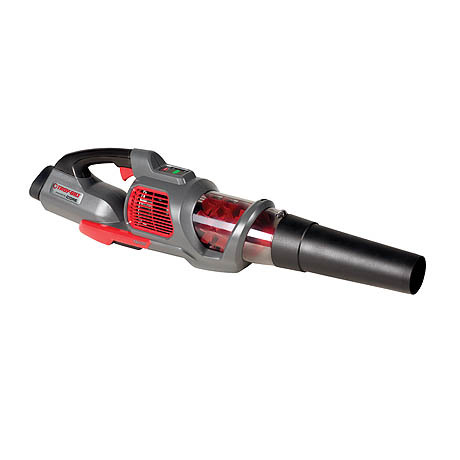 To clean up the garden edges quickly after trimming the grass, I use the Troy-Bilt CORE Cordless Handheld Blower . It’s nice to blow away any leaves that collect against the garden edging. Now, for the ultimate purist in natural garden edging, the D Handled Garden Spade is perfect for sharp and clean deep cuts through the sod edge. It is not too tall, has a soft grip handle and has a nice ledge for footing. I hope you were inspired by some of these garden edging ideas and check out the tools that help you get the job done! Edging is always a challenge especially if you have quack grass and other invasive species making inroads into your gardens. 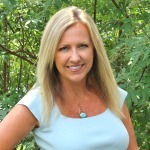 I particularly hate aspen or balsam poplars that send their roots through and under any edging, 😛 BUT I love your post because eternal hope always grows strong in a gardener and the photos bring joy – happy gardening Kim!